Kuzuzangpo la... greetings from Singapore! It has been over a month since my eventful trip to Bhutan in December 2018. Though I did not get to see much of Bhutan (it was unfortunate that the flu bug got to me about a week before my trip to Bhutan. With low immunity and the high altitude, I was taken ill on day one in Bhutan), I had experienced and was touched by the warmth and kindness of the Bhutanese people, from my first encounter, where I was attended to by Ms Ugyen Dema at Drukasia Singapore office and during my stay there. Mr Tshewang Penjor and driver, Mr Jimie. Their professional advice and the way they handled my medical needs during my stay is noteworthy and much appreciated. Just to share, I had to seek medical attention and treatments in Thimpul, Gangtey (overnight stay) and Wangdue due to the many bouts of severe headaches, nausea and vomiting along the way. Penjor did not hesitate to pat my back when I vomited and gave me water to drink and piggy back me when I was too weak to walk, just like how a family member would. Never once did I feel rushed or sense any irritation from Penjor or Jimie when we had to make the many pit stops. It was tough not only for me but also for Penjor and Jimie. They took it in their stride. I was comforted and felt safe with them. They were caring, patient and understanding throughout. These acts of kindness and dedication, I will always remember. Penjor has a caring, cheerful and fun-loving disposition. He is a responsible, steady and calm worker who is quick in sizing up the situation and is able to make sound decisions (when i was adamant not to go to the hospital when in Gangtey, he took time to explain and reason with me. He ensured my safety was top priority and I am grateful for that). He worked well even in a highly stressed environment and responded well in time of crises. From my observations, with his amicable personality, Penjor is also much liked by his fellow colleagues. This was clearly seen in the support and help that the other guides and driver rendered to him when he had to handle my medical crises (especially on one occasion, my condition was so severe that I had to be rushed and warded at the Basic Health Unit in Gangtey). Please also help me extend A BIG THANK YOU and KUDOS to these kind and wonderful Bhutanese folks too (who are working at your organisation and to whom I did not have a chance to thank personally). 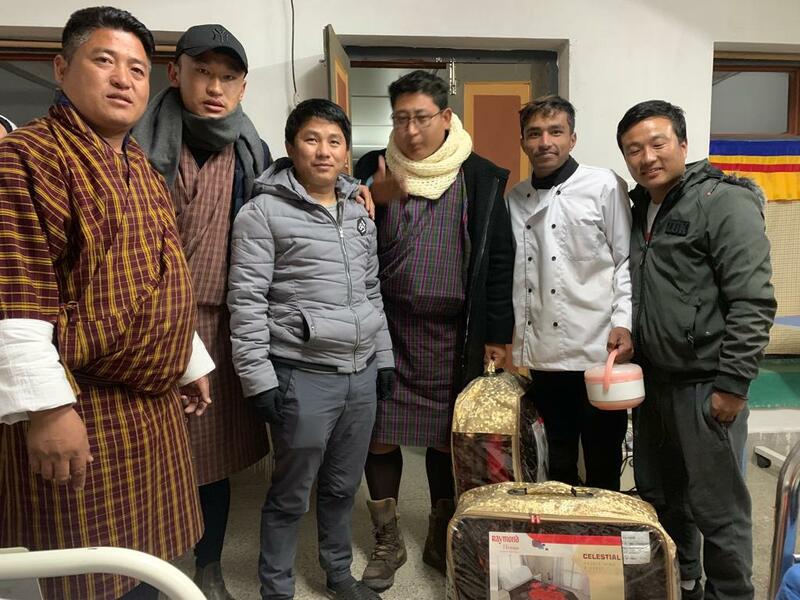 For your information, they all made the long and arduous trip from Gangtey ABC Lodge to Gangtey Basic Health Unit to send food and blankets to us. My travel partner and I would not have survived the cold without their help. Frankly, my travel partner and I were a little disappointed upon arrival because a different guide was assigned to us without prior notice and notwithstanding, we had a written confirmation from Drukasia Singapore office that they were able to accede to our request for a specific experienced guide (who had many good reviews). We thought Penjor, being young and a freelance guide, would lack the experience. We were biased and disappointed at first. Penjor proved us wrong. He was informative, easy-going, caring and dependable, all that we were looking for in an experienced guide. He is passionate and takes pride in his job. Jimie, the driver, has a quiet disposition. He is a smiley, caring and a careful driver too. Penjor and Jimie worked well together. Overall, we enjoyed and appreciate their service and company. It would be good and I believe would mean so much to Penjor and Jimie if your esteemed organisation could give the due recognition to them so as to encourage them and others in the organisation to keep up their excellent work attitude that goes beyond the call of service.